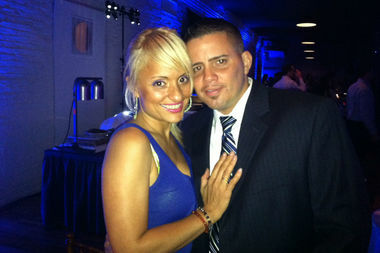 Aurora Maldonado and Andy Singleton recently bought a home together in Bay Ridge. EAST FLATBUSH —Katty Rivera always imagined she would get married first, then buy a home and have kids. But after three years and two kids, Rivera and her partner, Carmelo Pecoraro, are instead putting all their resources into buying an East Flatbush townhouse, including money that was meant for their dream wedding. “We would definitely love to get married, but right now our focus is purchasing this home,” said Rivera, 37, a real estate agent with Ideal Properties Group. Real estate and legal experts regularly see unmarried couples buying property together — even asking family members to gift them money for the property in lieu of helping pay for a splashy wedding. But the process bears challenges that a marriage license would negate, many say. If a married couple were to split, the legal union makes it easier to divide property and assets. Those protections, however, aren't necessarily in place for unmarried people if things get ugly. Corcoran broker Aurora Maldonado and firefighter Andy Singleton, both 40, recently bought an apartment together in Bay Ridge after three years of dating. They decided to postpone a walk down the aisle after falling in love with a $735,000 two-bedroom. “To me, that’s more important than blowing a large amount of money for one party," Singleton said. They did, however, ink an agreement on how to handle the property in case they break up, they said. There are plenty of costs associated with buying an apartment or house, whether its immediate ones like the down payment or closing costs or long term ones like mortgages, bills and possible renovations. Sit down with your partner and discuss what you are most comfortable contributing and how you can handle those costs between the two of you, said real estate attorney Jean Chou. Buying a home together is a legal decision that involves combining your finances and opening yourself to risk so be open, honest and non-judgmental about each other's history, Cole said. “If you can talk about money, you can talk about anything,” she said. A happy couple doesn't always want to consider the possibility of ending the relationship but discussing those thorny issues now can make your life a lot easier in case you break up, experts say. Without clearly outlining the future of the property if the relationship ends, "you find yourself in a potential battle with each other," said Craig L. Price, a real estate attorney. That also includes what would happen to the property in case one partner dies. The situation could get even more complicated if that person had children with a former spouse, Richardson noted. Splitting the property in case of a breakup can get messy for unmarried couples since there isn't always a legal precedent to help divide the assets. That's why experts say it's important to have a contract that outlines who owns what percentage of the property — a split that could depend on which person has financially contributed more to the purchase and upkeep. It's important to spell out the terms of the agreement, including how the proceeds would be divided in case of a sale, break up or if someone dies. "It's much easier to come up with terms you can agree on when the relationship is good, than when there is a breakup in the works," said divorce attorney Morghan Richardson. The most common types of property ownership for unmarried couples are "joint tenants with rights of survivorship" — in which the entire ownership goes to the surviving partner in case of a death — and "tenancy in common" in case there are different heirs to the property, real estate attorney Amelia Matsoukis explained. If marriage, but not a big wedding, is in the near future, think about making your union legal with something simple at City Hall before buying a home together and then celebrating with friends and family later. “You just have different legal protections in place when you’re married,” Cole said. If you were married but your name wasn't on the deed, divorce laws would protect your right to the property, Richardson said. "If your name isn't on the deed and you aren't married, you technically own nothing," she said.